The sport was invented in Mexico, Acapulco in 1969 by Enrique Corcuera. The Argentines made this sport also popular in other Latin American countries and in the eighties it came to Spain. This sport is called pádel , a Hispanicised word of the word ‘paddle’ but officially accepted by the RAI (Royal Academy of the Spanish Language). Pádel consists of three main elements: the racquet, the ball and the court. The racquet has an unlimited number of holes (9 to 13 mm) with a strap that attaches to the wrist as protection. Its use is mandatory. The ball is like a tennis ball. The court is half a tennis court with walls like a squash court. The court is entirely closed, constructed with areas and materials that allow a regular ball bounce and meshed metal areas where the rebound is irregular. 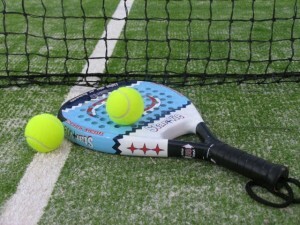 Pádel is played in pairs and with many rules similar to tennis and some to squash. Attend one of our Pachangas to try it out or contact one of our members, who will be happy to inform you where you can play.